Theresa May's vision for Brexit has been defeated three times in the Commons. And the man who was responsible for trying to deliver those votes suggests it would have been better to try something else long ago. 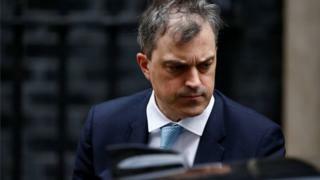 Julian Smith has told the BBC that the government ought to have admitted after the election that it would inevitably have to move to a softer Brexit, saying ministers should have been clearer about the consequences of losing their majority then. But here's the tricky thing - the prime minister has never acknowledged publicly that she might have to soften up her deal. And many Conservatives, including some in cabinet, believe it would be unacceptable to do so. The chief whip also says he witnessed colleagues trying to destabilise Mrs May at the cabinet table and that the current crop of senior ministers is the "worst example of indiscipline in British political history". Parliament will today vote on a series of different versions of Brexit, in an attempt to find a way out of the gridlock. MPs are likely again to show support for a closer relationship with the EU than the one the prime minister has put forward, but it's still not certain they will be able to agree on one option that can get a majority. Mr Smith, and others in government, suggest the prime minister might still put her deal back in front of MPs, perhaps as early as this week. Whips are, hypothetically, the keepers of secrets inside government. But in these turbulent times, few conventions still apply.